The University of Pennsylvania Museum of Anthropology and Archaeology (The Penn Museum) commissioned White Box Theatre to make a multi-disciplinary performance of the Epic of Gilgamesh to premiere in September of 2019 in Harrison Theater. Six weeks into the process, we shared the early part of our exploration including puppetry, dance, and music as part of a weekend-long celebration of the opening of the Middle East Galleries. The development process includes: reading, discussing, making objects, experimenting with movement, and curating those components into visual poetry. We worked with seasoned White Box studio-makers and new volunteers. For the first part of the project, we were in-residence with Philadelphia mosaicist, sculptor, and painter, Isaiah Zagar in his tremendous South Philadelphia studio. We also spent two days in-residence at Delaware State University experimenting with building and performance techniques with 11 students in Heather Ossandon’s Sculpture class. The Epic of Gilgamesh seduces with the scents of orange groves and dates, the feathers of exotic birds, the wet rivers of the Tigris and Euphrates, the taste of milk, and visions of barley and lapis lazuli. It offers the order and safety of the city-state, and the wilderness – with thickets of despair and uncertainty. It invites us learn to about the crescent of land between the two rivers where agriculture and civilization sprouted quickly. It reveals something about friendship, nature, and how we make meaning. The story of Gilgamesh appears to be from 2100 BC. It is the earliest story known to be written down. It is recorded in cuneiform on clay tablets. The oldest of these tablets were found in Mesopotamia. Gilgamesh was the king of Uruk. He was a formidable king–he built a 6-mile wall around the city to protect the people. He was a decent warrior and had other good qualities, but he also took advantage of the “rights of kings,” and would bed every woman on the day of her marriage. The people of Uruk didn’t like this. They prayed to the Gods for justice and the gods sent down a wild man of equal strength to challenge Gilgamesh–to keep him in check. This wild man, named Enkidu, came down from the heavens and lived with the wild animals until a woman, named Shamhat, seduces him and thus civilizes him. Once Enkidu is civilized he enters the walled city of Uruk and challenges Gilgamesh. They have a long wrestling match which neither wins. The equality in strength ends in a mutual respect and friendship and they go out into the world to test their strength. Their friendship develops as they travel across mysterious and beautiful landscapes, sharing dreams and visions. Like many young men, they decide to take huge risks and commit transgressions to prove their strength. They start by killing Humbaba, the protector of the Sacred Cedar Forest. They also cut down the trees of the forest. Most of the gods are not happy, except the goddess Ishtar who becomes smitten with Gilgamesh and asks Gilgamesh to marry her. Gilgamesh says, “I would do anything for you but marry you. I know how you are. You find your obsessions, put them/us on a pedestal, and then we become your slaves.” Ishtar is enraged. She threatens to punish everyone for the rejection by having the dead walk the earth. To appease her, her father agrees to send down the Bull of Heaven to destroy Gilgamesh and Enkidu. Against all odds, Gilgamesh and Enkidu slay the bull. Now all of natural order is turned on its head. The men have destroyed the Sacred Cedar Forest, and its protector, and the Bull of Heaven. The gods come together and decide that one will die an inglorious death, not in battle, but of a humbling, disfiguring disease, and the other will be left alone, to dream in sorrow. And Enkidu dies. In the second half of the story, Gilgamesh has to come to terms with loneliness and mortality. This is a performance in development. It can be adapted to museum spaces, large public spaces, or a proscenium stage 20ft x40 ft.
We are particularly interested in developing components in residence in universities and community centers. I started by wanting to use football players or wrestlers to think about how physical battle, how the sound and feel of the slap of flesh grounds us in our smallness, and invigorates us to largeness. 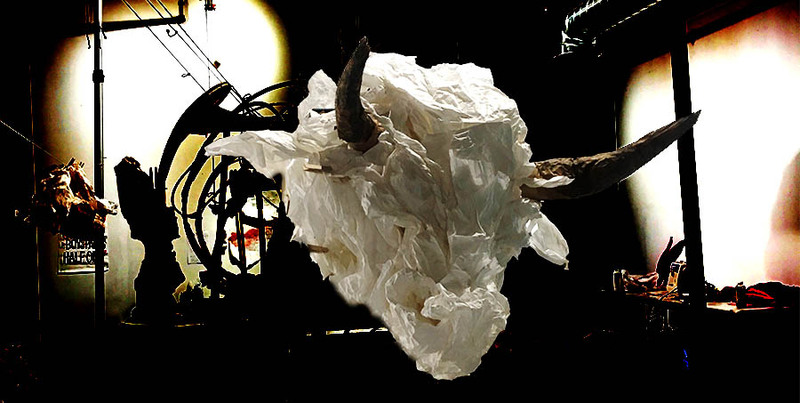 I was equally attracted to the bull and the challenge of the large mechanical puppet. Lastly, but equally, I liked the female gatekeepers, the guides, that positioned and directed the actions of men. I liked the idea that the sacred cedar forest was populated by the sound of birds – and the airy-contrast of the birds and their sounds to all the weight of the invigorated flesh. So that was the landscape I began to build. Through the creation process, I began to understand more things, the way color might become a through-line and also metaphoric. There are endless dances with wingless birds… the moment we watch the trailing shadow of the body who has left. The pleasure of the noticing… the pleasure of the gluing the paper and correcting the feet… Alec’s eyes and Melissa’s mouth… hearing of syllables in “Gilgamesh” and “Enkidu…” the redness of the paper… the perfection of muscles… the focus of an ensemble carrying… that is at the center… against all logic… at least for now… I give you that… not about history, or material culture, or gender, or the environment, but just some excitement or engagement in the beauty. I keep riding the wave. Steve Tinney, Eric Baratta, Kate Quinn, Tena Thomason, Arielle Brown, Isaiah Zagar, Tom Miles, Conor Corcoran, Jennifer Snead, The Philadelphia Cultural Fund, The Lenfest Foundation, The Penn Theatre Department, and The Penn Museum.